Let me start with the more recent event: On Friday evening on arriving in Port Askaig the ‘Isle of Arran’ was involved in a minor collision with major consequences with the linkspan. While the ferry has already returned to service after some quick repairs the linkspan requires significant work and is currently closed. This of course means Port Askaig is closed for both ferries (The ‘Isle of Arran’ as well as the ‘Hebridean Isles’), certainly for weeks, but possibly for months until the necessary repairs can be completed. 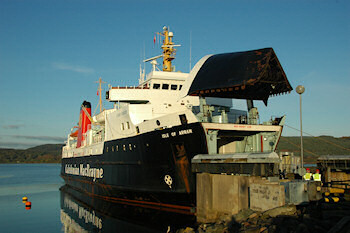 During that time only Port Ellen can be used by the ferries. With the stormy winter season approaching rapidly this causes great concerns, as the Press & Journal reports: Fears for Islay ferry service after accident at Port Askaig. To add insult to injury the report from the accident in February has been published this week: Some might remember the ferry crashing into the pier in Kennacraig, taking her out of action for several weeks. Today the BBC writes Mechanical fault caused ferry collision in a slightly inaccurate report (she didn't reverse into the harbour) about the findings of the MAIB. In (very) short, the reasons identified were mechanical failure combined with complacency. For the long version head to the full Marine Accident Investigation Report: Isle of Arran. Some interesting reading with a lot of information about the accident.